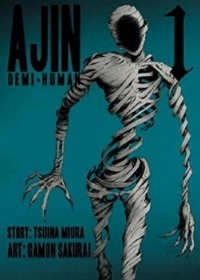 With Ajin, the manga artists opted to take the dark, cynical route with their story, creating a world in which these so-called “demi-humans” are reviled by the general public, captured by the government, and constantly experimented on in order to further the scientific advancement of mankind. The story begins with the hard-working high school student Kei Nagai, whose only goal is to keep working hard so he can “become a fine human being.” While walking home one day from school, Kei gets hit by an eighteen-wheeler, which rips his body apart from the waste down. To his shock (and to the shock of the witnesses surrounding the truck), his body pulls itself back together as if the entire incident never happened, and his identity as a “demi-human” is revealed. Knowing full well how the world sees and treats demi-humans, Kei runs from the scene, turning to his only true friend, Kai. Always one to try and blend into the crowd, Kei had done his best in his high school career to leave behind any aspect of his life that would keep him from doing so—including abandoning his childhood friend Kai, who he labeled as a “freak” just earlier that day. Surprisingly enough, Kai is more than willing to help his desperate friend, and the two make their way out of town on a motorcycle. But with a bounty on Kei’s head and the police close behind, will Kei ever be able to live a normal, peaceful life ever again? As far as the premises go, Ajin: Demi-Human has one of the stronger, more universally appealing ones out there. Envisioning a world in which a few dozen known immortals blend in to everyday society is compelling no matter which way you slice it. But how does the manga handle this premise? Well, it does an okay job. The story thus far through volume one isn’t a train wreck by any means, but it definitely doesn’t seem to be living up to the potential inherent in its premise. The characters are serviceable, but Kei is so middle-of-the-road and generic, it’s very hard to latch onto him as a lead. He does get easier to follow throughout the volume as bits and pieces of his past come to light, but other than his demi-human nature, there is nothing distinctive or endearing about his character. His best friend Kai is easier to like, as he a kid with personal conviction and a positive attitude despite his perceived “freak” status (which is a title that is never explained or justified in the volume). However, his willingness to go on the run with Kei, while predictable for the story’s sake, is never earned. It’s very possible that reason may come to light in later volumes, but as of right now, it doesn’t seem very believable. In fact, believability as a whole seems to be the manga’s main weakness. Namely, it is the world in which Ajin takes place that seems to hold little water. It is revealed in the volume that immortals, or demi-humans, were first discovered 17 years prior in Africa, and since then there have been 47 confirmed demi-humans discovered. The concept of an immortal being is very thought-provoking, but in this world, the humans look down on them as lesser beings. Understandably, there have been many instances of this in human history (i.e., race, homosexuality, etc. ), but would not the initial reaction to immortality be fear rather than condescension? A biased opinion, of course, but it is something that stood out in the story. Another issue with this first volume was that it explained the concept of demi-humans in Kei’s class hours before he discovered his own demi-human identity. Yes, it is very difficult to get such points across in a story, but nothing spells “contrived” more than a teacher explaining important backstory mere hours before it is about to become relevant to the main plot. These are all some pretty big problems, but despite these weaknesses, the manga itself was actually a very enjoyable read. Its strong premise holds up well throughout the volume, and the plot moved along at such a brisk place that many of these aforementioned problems only became problems upon further reflection. In the moment, however, Ajin volume 1 is quite the thrilling ride that leaves the reader with enough questions to have them return for volume 2. Sakurai fares better in the art department than Miura fares in the story department. The art is detailed and captivating. There is a real tangibility to the way characters are drawn and the world around them. The action panels are beautiful to look at, and most importantly, it’s all very clear and easy to follow. Some of the panels are incredibly violent—many showing the dismemberment of some of the characters—but it never comes across as exploitative or gratuitous. It only shows as much as it needs to get the point across, which is a balance that a lot of manga doesn’t have. Being a Vertical release, the physical volume is also a fine piece and helps complement the beautiful drawings. Its cover is minimal and sleek, and the paper behind it is dense and of a higher quality than standard manga fare. On the whole, despite some weaknesses, Ajin: Demi-Human is definitely a title worth taking a look at. While the execution doesn't quite live up to its premise, it has plenty of potential to hit that high bar as the story continues in later volumes. So if you're in search of a supernatural thriller, there's a good chance that Ajin will leave you satisfied and hungry for more.